This week I'm thinking about the career of Josep Escobar i Saliente, who signed his strips simply Escobar for over fifty years. It's hard to overstate how important his work was as a representation and a sly critique of Franco-era Spain, from the eternally-hungry "Carpanta," a symbol of postwar deprivation and ingenuity, to the mischievous "Zipi y Zape," brothers obviously descended from the cautionary German Max und Moritz via the knockabout American Katzenjammers but who under Escobar's pen became irrepressible symbols of anarchy and wit who half the time emerged victorious over their mutton-chopped patriarch, a promise that despite repression the kids were all right, to the bitterer and eventually censored "Doña Tula, suegra," a fearsome mother-in-law used by Escobar to critique the institution of marriage, to strips about domestic workers like "Petra, criada para todo" (a maid-of-all-work whose village background made her both woefully naive and surprisingly resourceful in the big city) and "Blasa, portera de su casa" (a caretaker who runs her pension with an iron fist) that were clear-eyed and sympathetic about the limited choices available to women even when their first duty was to laugh at them. The foregoing may seem to rather overstate Escobar's social commentary if you actually spend time reading these strips in bulk: they are the kind of profoundly traditional slapstick burlesque that Anglophone comics readers might associate with 1920s newspaper strips or classic Beano, often elegantly drawn (especially in the zenith of the mid-to-late 1950s) but intended strictly for a juvenile audience even when their language was satirically highfalutin. Of course these comics couldn't be overtly critical of Francoist society, but slapstick at its root contains a basic disrespect for the social order. (Although it may act as a sort of release valve, channeling discontent into harmless laughter instead of more direct action.) Escobar's activity as a member of a cartoonists' union during the years of the Republic had been noteworthy enough that he was imprisoned after the falangists won the civil war, and he was one of the group of five cartoonists who dared to leave the powerful Bruguera publishing house in 1957 to try to establish an independent, more adult-oriented comics magazine. Which failed; and Escobar's comics after he returned to Bruguera in 1960, while still as clever as ever, tended to be more mechanical and less engaged with even such subliminal social critique as his earlier work had contained. 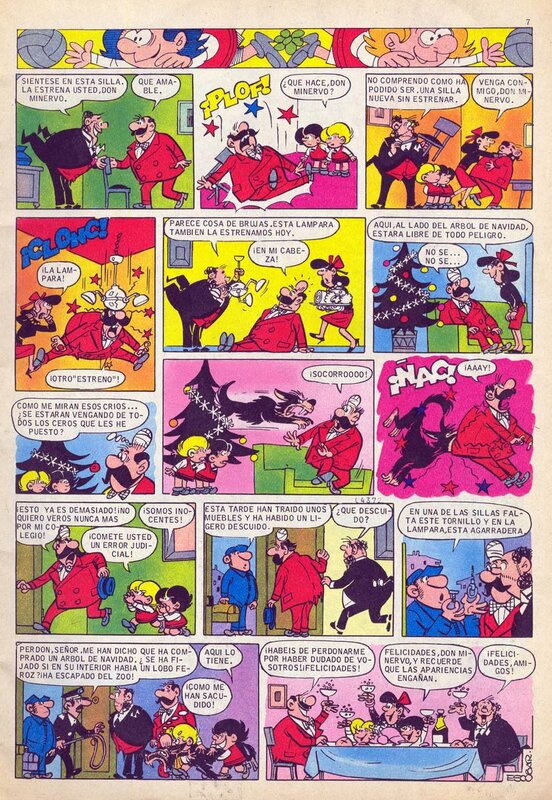 But even hermetically sealed in their own cartoon worlds, Carpanta, Zipi y Zape, and Petra were still very popular, and he continued drawing them, along with various longer- or shorter-lived strips of less renown, until Bruguera went out of business in 1984; and when Ediciones B bought Bruguera's catalog in 1987, he resumed drawing them until his death in 1994. He was the oldest of the classic Bruguera cartoonists, and one of the few who had had a substantial cartooning career prior to the civil war, as well as having a hand in Spain's early animation industry, writing for the theater, and even working a brief stint as a designer of toys. Always a rock-solid designer, his style evolved in several directions over the years, from the rounded Disneyesque figures of the 1940s to the sharp modernism of the 50s, before settling on the broad, chunky outlines of his elderly post-60s work. Although I'm a firm believer in appreciating the lines and designs of cartooning regardless of language, if you can't read Spanish you miss about two-thirds of what made Escobar so great; so I'll be attempting a little more interpretation of each strip I reproduce below (without doing a full translation) than I usually do. Escobar, like most of his generation of Spanish cartoonists, typically produced four or more pages of closely-drawn comics a week for more than fifty years: this can only be a bare sampling, mostly drawn from the yearly Almanaques of Bruguera's flagship Pulgarcito magazine. "Carpanta," from Pulgarcito Almanaque 1948. 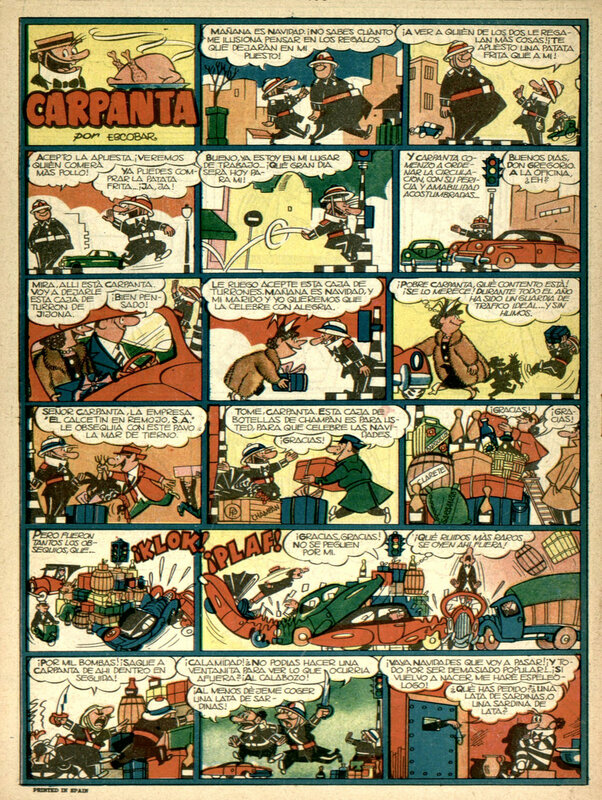 This double-page Carpanta strip is one of the major texts in early tebeos: an extended metatextual gag in which Carpanta, a character defined by always being hungry and always being denied food (as if Peanuts' only gag was Lucy with the football), defies his creator — Escobar is a character in the strip, his checked suit one of the primary visual motifs — by teaming up with all the stars of the Pulgarcito magazine, which was only two years old at this point, to rebel against their creators — Escobar includes caricatures of all his colleagues circa 1948 — and throw a feast so that Carpanta can finally get a meal. The rebellion is a failure, of course, because Escobar has bribed one of the characters (and not even one of his own, but Iranzo's Pepito) to betray the cause, but the narrative inventiveness and the brio of the cartooning is remarkable even seventy years later. For an English-language audience used to the more open layouts of American comic books, the density and even crampedness of the standard Bruguera format, with its six-tiered pages and fulsome balloons, can be an immediate visual turnoff, but if you actually buckle down to reading the work it flows surprisingly well; like Harry Tuthill's Bungle Family (and precious few other U.S. strips), satirical tebeos like this can be as much a literary form as a visual one. "Carpanta" from Pulgarcito Almanaque 1951. Three years on, and social satire has taken over from the metafictional, and Escobar has developed a new elegance of line and shape. Gifted a card on the breeze, Carpanta poses as a piano mover in hopes of receiving a tip with which to dine lavishly, but the aristocratic household he bumbles into is more interested in quarreling with each another than in noblesse oblige, so he ends trying to roast a hazelnut and, of course, burning it. "Carpanta," from Pulgarcito Almanaque 1955. Four years later, Escobar's style has progressed: broader and more cinematic, combining both social satire and metafiction. Carpanta has landed a job as a traffic warden, and the people of the neighborhood, recognizing him as one of the stars of Pulgarcito and brimming with Christmas spirit, give him gifts of food and drink to enjoy once his shift is done; but of course (such are the dangers of relying on individual charity rather than a social program) they give him too much, piling so high that he can't see the roundabout, with the results you can see for yourself. Even the final gag, in which his jailer can't remember whether he requested a tin of sardines or a tin sardine, lands well. "Carpanta," from Pulgarcito Almanaque 1961. In which Carpanta is given the gift of a cockerel for Christmas dinner; slavering, he hurries to make arroz con pollo, but then the hen and chicks of his rooster turn up and plead for mercy; tender-hearted, he lets them go; but they left him a gift of eggs! As I said, this is the moment when Escobar stopped trying, and both gags and sentiment became mechanical. There's still some solid cartooning here, although the stiffness of Escobar's golden years is already in evidence, and the social criticism has entirely vanished, replaced by mildewed fantasy. "Zipi y Zape" in Pulgarcito Almanaque 1951. In which the boys enter a competition to create the best Nativity scene and give their Bethlehem some running water, but fail to understand volume. The Almanaques, which usually bore a Christmas theme, were rarely the best showcase for the anarchic Zipi and Zape, who functioned best when they could reshape the world around them at will rather than having to fit into a standard narrative. "Zipi y Zape" from Pulgarcito Almanaque 1972. Early on in the 1960s, Bruguera stopped having their cartoonists hand-letter their strips, opting for set type as a means of quick-and-dirty censorship as well as streamlining the drawing process in order to pump out more pages. Influenced by the popularity of French imports, they also increased the page count for every strip, slowly expanding from the standard one- (or in exceptional cases two-) page strips to two, four and by the 80s often six or eight pages. Although the tiered format remained standard (and occasionally five instead of six tiers), it could now be broken on occasion, and bright, eye-bleeding colors with pre-digital gradients were applied in an attempt to modernize for the pop era. Escobar's style, increasingly old-fashioned, never felt wholly at home in this new world: even the whiz-bang slapstick of this strip, as the boys' teacher has mishap after mishap befall him during a holiday visit (for once, not of the boys' doing), feels stiff and draggy. The density of the 1940s and 50s has given way to more spacious panels, but the world in the strips somehow feels smaller and more artificial. "Petra, criada para todo" from Pulgarcito Almanaque 1955. The third of Escobar's most long-lived strips started later than "Carpanta" and "Zipi y Zape," but he was one of the few Bruguera cartoonists to draw strips about women who were neither grotesques (as with Doña Urraca) nor purely decorative (as with most of Nadal's strips). In Petra's first appearance in an Almanaque, nettled by her employer's declaration that she won't get a Christmas tip because she is considered family, and tips are only for workers from the outside, she disposes of the trash-man, the lamp-lighter, the baker, etc. in order to pose as them all and collect their tips: the dark final panel, in which she barricades herself against the police, is both hilarious and demonstrates a clear-eyed understanding of the uses of state violence against labor unrest. "Petra, criada para todo" from Pulgarcito Almanaque 1962. Even after the defeated return to Bruguera, "Petra" continued to be a strip about labor and class: as here, her employer, after discovering that village-bred Petra is accustomed to decorate for Christmas with a creche rather than a tree, insists that a tree is proper for city sophisticates, and demands that she order a tree from her village. That the tree contains a bear is of course pure slapstick (and the gag would be recycled in the Zipi y Zape strip above), but the final panel, in which it dawns on the employer why rural people might prefer creches, and Petra stammers, "You never listen to me," is just about as solid anti-bourgeois propaganda as a children's magazine subject to falangist censorship could produce. From DDT #159, early 1950s. A final non-Pulgarcito Almanaque strip to show some more of Escobar's early tonal range. "Doña Tula" as I mentioned above, was a standard fearsome-mother-in-law strip which Escobar took to such baroque heights that he was forced to stop drawing it because the censors declared that it was an attack on the institution of marriage. This strip, in which the normally pliant husband finally figures out a way to get some peace and quiet, by swapping pictures with some other guy on his identity card and running off to the Americas, is nearly black comedy by the standards of Bruguera's normal output. The DDT magazine was pitched a few degrees more adult than Pulgarcito, but it wasn't supposed to be this non-normative; the end by censorship of "Doña Tula" in 1955 was one of the reasons why Escobar left two years later to co-found the independent Tío Vivo. One of the reasons I've been thinking so much about Escobar's work this week is that I finally got around to reading a 2016 graphic novel by Alfonso López called El Solar (the [empty] lot). This isn't a first for López: in 2007 he published Estraperlo y Tranvía, a modern take on the classic TBO strip "La familia Ulíses," and he's drawn two revisionist adventures of "Capitán Trueno," one of the all-time most popular Franco-era adventure strips about a medieval Spanish knight-errant inspired by Prince Valiant. But Ediciones B, who owns the rights, declined to let him use Escobar's characters outright for El Solar, so the names were changed and the book came out from venerable underground publisher La Cúpula. It's been very well received: comparisons to downbeat filmmakers like René Clair or Luis García Berlanga and modernist novelists like Camilo José Cela sprout up in reviews. There's a heavily ironic spy plot, as if just to give the story some shape, but the bulk of the work is a brooding, though still comedic, meditation on postwar Spain as a place of repression, deprivation, and fragmentary attempts at human connection despite it all. It would have been impossible to tell this story with any other Bruguera characters: Escobar's social conscience, even buried beneath his slapstick, shines through López' gorgeous muted watercolors. I often adore postmillennial revisionist takes on classic comics: like Émile Bravo's Spirou: Le journal d'un ingenu or Darwyn Cooke's New Frontier, López combines the flavor of the original texts with a solid grounding in the history and culture of their contemporary milieu, as well as bringing his own strong (though classicist) aesthetic identity to bear. In each of these cases, I was already familiar with the original comics because I'm that kind of cratedigging nerd; but for most people, modern takes might help to open up the originals in a way that plodding criticism like mine never could. That's the hope, anyway.